(REUTERS/Mohamed Abd El Ghany)Egyptian Christians protest against the Coptic beheadings. Egyptian President Abdel-Fattah el-Sissi has said Christians fleeing Islamist extremists in the Sinai Peninsula will receive support following attacks that have forced more than 100 families to escape in recent days after seven killings. El-Sissi was quoted by the "Egypt Independent" newspaper and Coptic Christian websites on March 1 as ordering the government to provide immediate shelter to those who have left the peninsula in recent days. He said the country's Copts, who are a minority religion in the mainly Muslim country are being "targeted as part of a cowardly plot," the recent killings of Christians in suspected jihadi attacks. 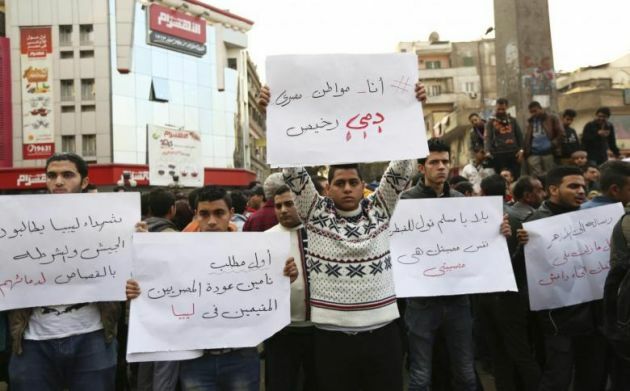 A total of 450 people who have fled North Sinai, with many families receiving assistance from the local church and other faith communities in the northeastern city of Ismailia, the news agency EFE has reported. For more than three years, Islamist militants, who swore allegiance to the Islamist group known as ISIS in 2014, have been attacking police and soldiers in northern Sinai, killing hundreds of security officers. Muslims suspected of being informers have also been targeted in the region that is the hub of Egypt's fight against war-waging Islamist extremists. In recent weeks, however, ISIS has turned its fire onto the Coptic community, The Financial Times reported. ISIS, also known as IS and Daesh, released a distressing video in February urging its supporters to target Christians across Egypt, describing them as its "favourite prey." The footage featured a suicide bomber who killed 29 worshippers in an attack on a Cairo church in December. Church volunteers arranged for the displaced families to be taken to shelters and camp in the province, and expect more families to arrive in the next day or two, Deutsche Welle reported. The latest string of attacks in northern Sinai's El Arish against Coptic Christians are indirect attempts by armed groups to undermine the government, according to Egyptian experts and analysts, Al Jazeera reported. The recent incidents have raised questions about the lack of security for residents, particularly minorities, in the peninsula. Mina Thabet, a researcher at the Egyptian Commission for Rights and Freedoms, a local non-governmental organisation, described the incident as an "exodus." "People have no sense of safety whatsoever, they've been struck with panic and are still processing the events that have been taking place," Thabet told Al Jazeera, adding that more families were expected to flee in the coming days.